Pioneers in the industry, we offer tile saw wheel and ceramic tile saw wheel from India. 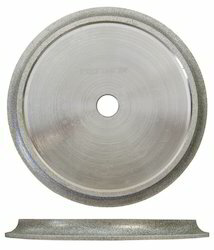 Tile Saw Wheel offeredcomprise carbide cutters that provide for versatile tooling support in processes involving cutting of rocks. 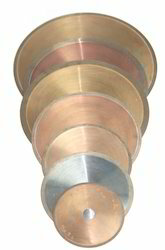 With the product supporting cutting of rounded edges of fused pieces for achieving right angled design, the saw wheel also is available in corrosion and abrasion resistant finish. Coming designed in compliance with international quality standards, these are used in applications like cutting of asphalts, concrete, granites and marble as well as are useful for cutting of stones like slat stone, hard granite, kota stone, marble, sand stone. Ceramic Tile Saw Wheel offeredare developed to provide for best sawing support and can be used in both wet and dry sawing operations. With the wheels designed in compliance with international quality standards, these are available in abrasion resistant finish and provide for longer service life and faster cutting support. Finding wide usage in ceramic industry and for tile cutting operations, we can make these available in different sizes as well as also custom develop these as per the specifications provided by customers.